Cross-cantering occurs when your horse travels incorrectly at the canter. A horse may naturally lead with either the right foreleg or the left; either is OK, but while turning right the horse should lead with the right foreleg and when turning left should lead with the left. 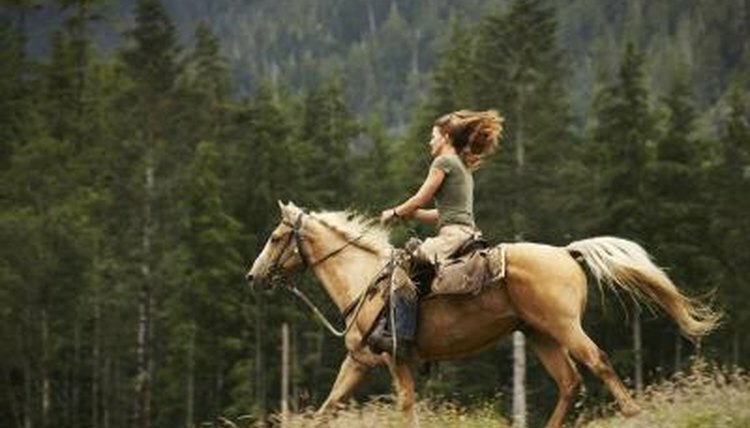 When transitioning, a horse can wind up moving as if he is on one lead in the rear and the other in the front. This cross-canter is not desirable; stop the canter and get your horse on the correct lead immediately. Do not let your horse travel in a cross-canter. Before you can understand why your horse is cross-cantering, you need to have a basic understanding of the canter as a gait. The canter is considered a three beat gait, meaning that the rider feels three distinct footfalls during each stride the horse takes. A cantering horse starts off each stride by moving one back leg, then moving the other hind leg in conjunction with the opposite front leg. The stride then finishes with the remaining front leg. The exact order of the steps depends on which lead your horse is on, because horses will lead with one front leg or the other, depending on the direction he's going. The cross-canter occurs when your horse's hind end and front end are moving as if they are on opposite leads. It is also called cross-firing. A horse may take off in a cross-canter or he may swap leads while cantering. A cross-canter is not something a rider should ever aspire to achieve. The cross-canter is an unbalanced partial gait that is uncomfortable to ride and difficult for the horse to maintain in a well-balanced manner. A cross-canter occurs most commonly in horses who are in the process of learning how to perform flying lead changes, where the horse changes from one lead to the other without breaking gait, but have not yet quite mastered the task and wind up cantering on both leads at the same time. A horse that is confused about which lead it belongs on may also cross-canter when cued for the canter. Horses who have difficultly using one hind leg may choose to cross-canter to reduce the amount of effort used by the hurting limb. Horses who have a weak hind end, rear leg problems or back problems may cross-canter because performing a regular canter is painful for them. One indicator that the cross-canter is a pain issue rather than a training issue is the cross-canter occurring only when the horse goes a certain direction. For example, if your horse canters perfectly to the left but picks up a cross-canter to the right every time, suspect pain may be causing your horse to cross-canter. Consult your veterinarian. What Is the Difference Between Jogging & Trotting a Horse?